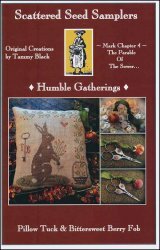 Humble Gatherings [E6811] - $12.00 : Yarn Tree, Your wholesale source for cross stitch supplies. Cross stitch pattern by Scattered Seed Samplers. A rabbit has picked some bittersweet from the vine that is growing up and out of the basket to create a partial border around the pillow tuck design. Stitch count 87w x 95h.